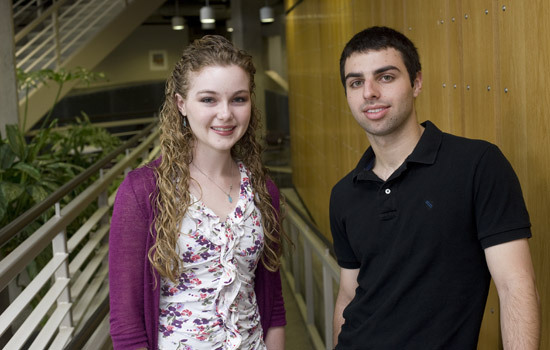 Kimbria Blake and Colin Axel, undergraduates in the College of Science, are RIT’s latest Goldwater Scholars. The foundation recognized Samuel Kennedy, not pictured here, with an honorable mention. Three students in the Rochester Institute of Technology College of Science have been recognized by the Barry M. Goldwater Scholarship and Excellence in Education Program. The foundation named undergraduates Kimbria Blake, from Chagrin Falls, Ohio, and Colin Axel, from Farmington, N.Y., Goldwater Scholars, and awarded Samuel Kennedy, from Bristol, Conn., an honorable mention. The Barry M. Goldwater Scholarship and Excellence in Education Program was established by Congress in 1986. The foundation awards scholarships to college students who intend to pursue careers in mathematics, the natural sciences or engineering. The award is based on academic merit. This year, 282 sophomores and juniors were selected from 1,123 nominees. Axel, a junior majoring in imaging science, will receive $7,500 for his senior year at RIT. He has conducted research modeling algae growth in Lake Ontario under the direction of professor Anthony Vodacek in RIT’s Chester F. Carlson Center for Imaging Science. Axel is now working with professor Carl Salvaggio on a project that remotely determines the weight of vehicles. He has also studied ice sheets through remote sensing while participating in the National Science Foundation-funded Research Experiences for Undergraduates program at the University of Kansas. Axel plans to earn his doctorate in imaging science with a focus on remote sensing. His goals are to teach and conduct research in environmental remote sensing. Axel is a recipient of a SMART grant, RIT Presidential Scholarship, Omnova Scholarship, Nathaniel Rochester Society Scholarship and a Carlson Imaging Excellence Award. He is a member of the RIT Honors Program. Axel is also involved with Habitat for Humanity, the Academic Conduct Committee, the Outing Club and intramural sports. Blake, a sophomore majoring in biochemistry, will receive $15,000 over the next two years from the Goldwater Scholarship program. She conducts research with professor Suzanne O’Handley in the RIT Department of Chemistry. Her research entails characterizing an enzyme from yeast and comparing it to the homologous virulence factor in the pathogen Staphylococcus aureus. She presented her work at the National Meeting of the American Society for Biochemistry and Molecular Biology in her freshman year. She has won an RIT Presidential Scholarship, freshman and sophomore awards from the RIT Department of Chemistry, College of Science Summer Research Fellowship, a College of Science Chemistry/Materials Science Research Fellowship and an American Society of Microbiology Summer Research Fellowship. Blake is a member of the RIT Honors Program and is an RIT Chemistry Research Scholar. She is a member of the American Society for Biochemistry and Molecular Biology Student Affiliates and the RIT InterVarsity Christian Fellowship. She is also a tutor and teaching assistant for the chemistry department. Blake plans to obtain her doctorate in microbiology or biochemistry. She envisions a research career in infectious disease. Kennedy, a third-year applied mathematics major, received an honorable mention from the Goldwater Foundation. He has conducted research with RIT professor Jobby Jacob and Korinne Dobosh, an undergraduate student at Montclair State University, in the field of mathematics known as extremal graph theory. They collaborated on a graph-coloring problem called “graph ranking” and presented their work at the Joint Mathematics Meetings in Boston in January. Kennedy is a member of the RIT Honors Program. He is also a recipient of the John Wiley Jones award from RIT’s College of Science. He plans to pursue a doctorate in pure mathematics and to teach at the university level.